Candies come in numerous colors and varieties and have a long history. The word candy began to be used in the late 13th Century, coming into English from the French “çucre candi.” Candy is made by dissolving sugar in water or milk to form a syrup, which is then boiled until it reaches the desired concentration or starts to caramelize. The resulting type of candy depends on the ingredients and how long the mixture is boiled. As the syrup is heated and boils, the water evaporates, the sugar concentration increases and the boiling point temperature rises. A given temperature corresponds to a particular sugar concentration. In general, higher temperatures and greater sugar concentrations result in hard, brittle candies, and lower temperatures result in softer candies. The candy business underwent drastic changes in the 1830s when technological advances and the greatly increased supply of sugar reduced its cost and opened up the market. Confectioners no longer supplied candy only to the wealthy, but to children, as well. The village candy store became a favorite of children of the American working class. Penny candies epitomized this transformation of candy, and candy became the first product on which children spent their own money. For this reason, candy store owners often relied almost entirely on the business of children to stay in business. Today the global sales of candy are about $60 billion. 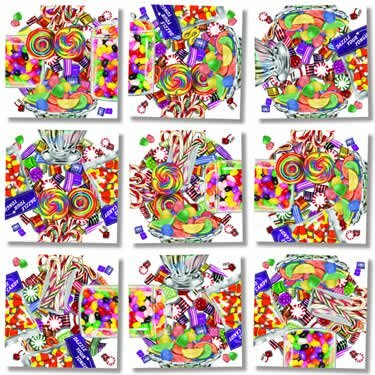 Award winning Scramble Squares® 9-piece brain teaser puzzles are Easy To Play, But Hard To Solve!® for children, teenagers, adults and senior citizens of all ages. Made in America Scramble Squares® puzzles teach patience, perseverance, fine motor skills and critical thinking skills and help maintain mental sharpness, while providing stimulating entertainment as either a solitaire game or a cooperative activity. Each puzzle package includes a panel of fascinating facts on the subject of the puzzle, as well as a trivia question and hidden answer to the trivia question, all packaged in a unique and handy resealable clear vinyl pouch, which can be stored easily in a standard 3-ring binder. Over 140 Scramble Squares® styles are available on nature, sports, history, culture, occupations, fantasy, science, technology, hobbies and activities. Displays come complete with the amazing 5-Minute Challenge® in store free puzzle giveaway promotion, which enable sales to be sweet!